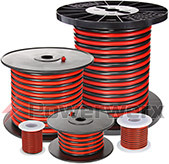 Bullet connector to Powerpole adapter cable - 1 ft long of 12 gauge Red/Black zip cord and incorporates 30 amp Powerpole connectors. 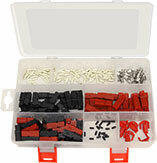 Comes with both Bullet ends for selecting the correct polarity! Ideal for Battery Tender, Jr. adapter cable. I got these to connect a 12v SLA batter to either a solar panel or AC charger, both of which had bullet connectors. They helped to standardize the power connectors I was using without having to cut off the current connectors and crimping on Anderson Powerpoles. On my cables though, the red cable was slightly shorter than the black one, so it doesn't sit straight, but that's a very minor thing that might only occur on a few of these adapters. Overall really good adapters.